A long time since I've posted on this blog, but we've just returned from a glorious week on the Canal du Nivernais in Burgundy, and what a pretty canal it is. It's a very good time of year to go if the weather's good, as it was. The day we drove home the rain started and hasn't stopped since - I pity the people on the canal this week! This was the first time on this canal, although we had a drive along it a few years ago, and decided it was a "must do". We picked up the hire boat from the base in Châtillon-en-Bazois, where the castle overlooks the wide basin. Fortunately, as every interesting building in France seems to be covered in scaffolding when I arrive, there was a handy clump of trees in front of the château. 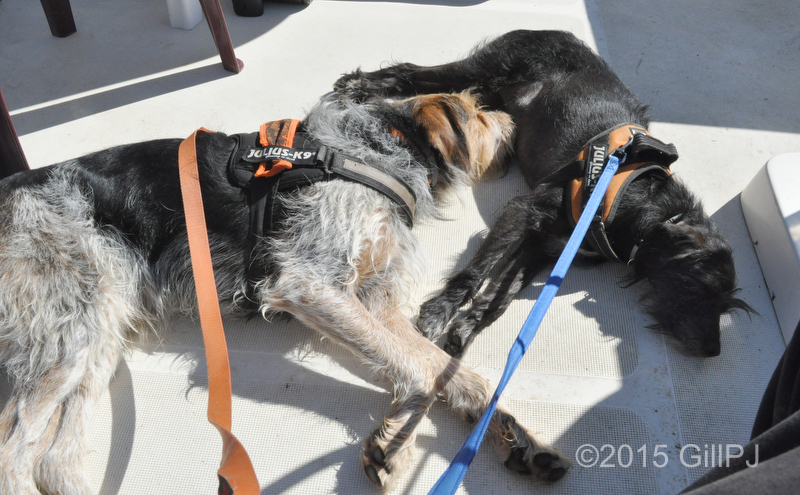 Although there were only two of us, and two dogs, we hired a Tarpon 37N (9 berth) from Canalous, having been severely lacking in space on a previous trip, and like a lot of hire boats, it was a little tired in places. We'd decided we would go north to Baye and then return and go south towards Decize. We had planned to at least go through the tunnels at Collancelle, but it wasn't to be. After we set off on the Sunday morning, 3kms and 1 lock later I opened the hatch to check on the dogs to be greeted by an alarm - engine temperature - so we called the base who sent out an engineer. The water pump on the engine had lost a fin, so that was a replacement and a few hours lost. When we started off again, the lock keeper at Mingot, a student holiday stand-in, asked us if we'd like to listen to his music, and of course for entente cordiale's sake we said yes. When the lock was full he picked up his vielle (hurdy gurdy) and gave us three marvelous traditional French folk tunes. A cheerful interlude after an annoying breakdown! He was a skillful player and the instrument was beautiful with hand inlaid mother of pearl. I forgot to take a photo, but here is one I took earlier at a show though it isn't nearly as pretty. 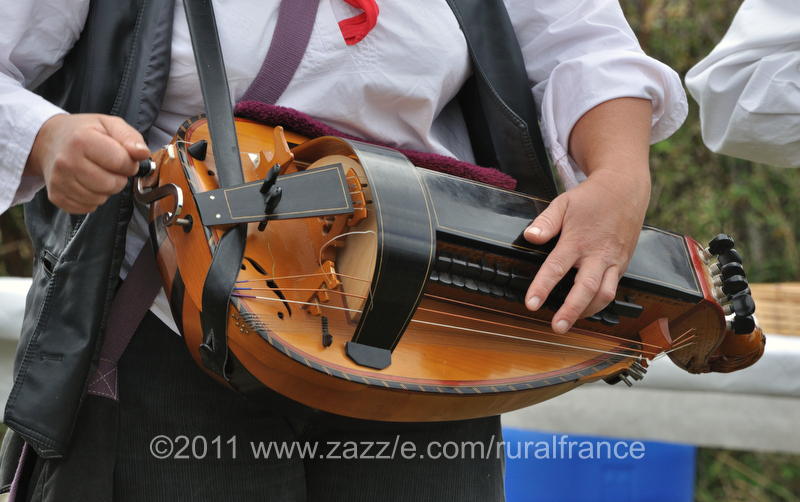 It's quite a popular instrument in France and looks quite complicated to play. 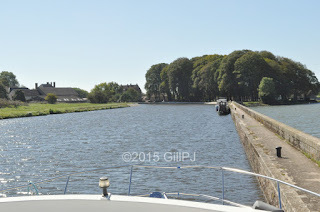 Moving on, we followed the tree lined canal through the three sets of staircase locks at Mont Marré and Chavagne, then through Bazolles, finally reaching Baye and the lake. I must say at this point, it's the first boat we've ever had with bowthrusters, and even though it feels like cheating, they are a boon when mooring with just a crew of two! The canal is separated from the lake by a rather scary narrow wall with mooring bollards, well, it's scary if you have to walk dogs that have been cooped up for a couple of hours along it. Dogs being dogs, and not terribly well trained ones at that, can be a bit of a handful, and though we planned to walk to the tunnels from there, it was hot and the dogs were pulling, so we walked back through Aqua Fluvial's boatyard, the dogs bravely taking the open mesh walkways on the gates over the lock which leads into the lake in their stride, and back to the boat after Raffles had a plunge in the lake to cool down (a soggy froggy doggy!). It was quite windy though warm, and a couple of people were courageously sailing dinghies on the lake, and one did manage to capsize. Setting off after a moment of relaxation on deck, we headed back South stopping above Bazolles overnight, a pleasant rural stretch surrounded by fields and not much else. Due to foreseen circumstances, we had to be back at the boatyard by Monday evening for a spare part to be fitted to the oven, and to hook up to power. Typical of French canals, it's quite hard to find a power connection - they're either not working, need a card or some such from the mairie which is closed by the time you get there, or everyone else has got there before you and there are no places left. This was the case when we got back to Châtillon, the only available spaces were too far from the power sockets, though we did try draping the power cable over a for sale boat which had been there for some time, it wouldn't quite reach. No matter, the engineer came and fitted the part while I walked the dogs, and we had tartiflette for dinner. 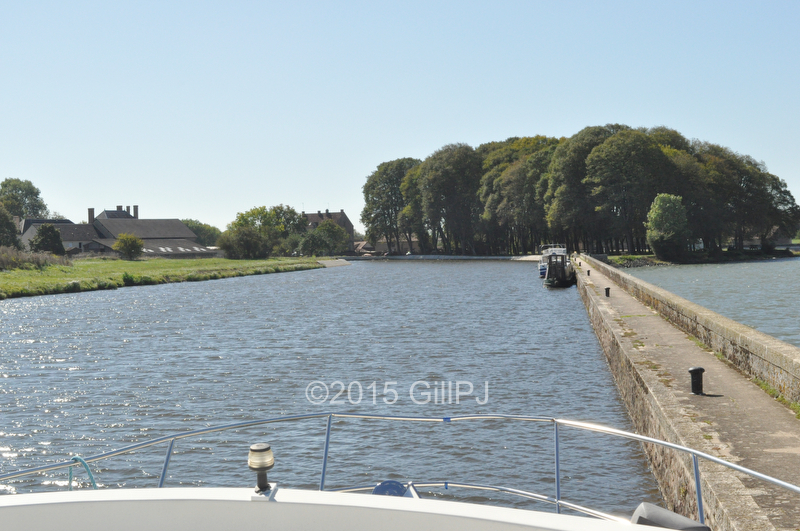 Next morning bright and early, we entered the lock out of the basin at Châtillon with another privately owned boat. We could see that they were concerned about the proximity of our boat to theirs, so we were using the controls to keep away, when suddenly - no forward or reverse! I went to the inside steering position and managed to get us gingerly out of the lock from there, peering through misty windows. We moored up again, still within sight of the hire base this time, so went and gave them the glad tidings. 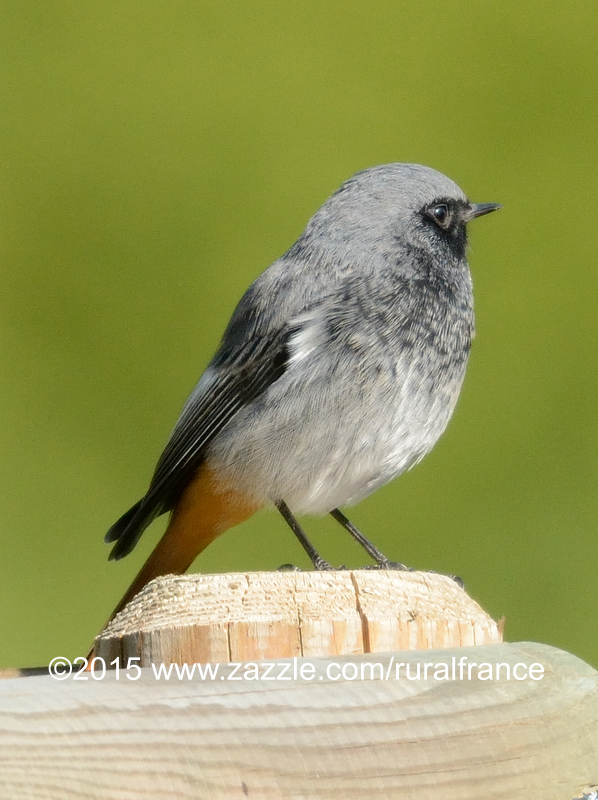 While there, I had time to get out my long lens and caught a black redstart on the fence. An hour and a half later, the engineer arrived, and this time changed the controls on the bridge, having to cut a chunk out of the boat to do so. The lucky dogs got a second walk while that was happening, and in spite of everything possibly, because of the good weather, we managed to retain our sense of humour. Making up for lost time again, we pushed on through the winding section until we came to rest below Sauzay lock, operated by a very cheerful lock keeper so he got two bottles of beer instead of the usual one. 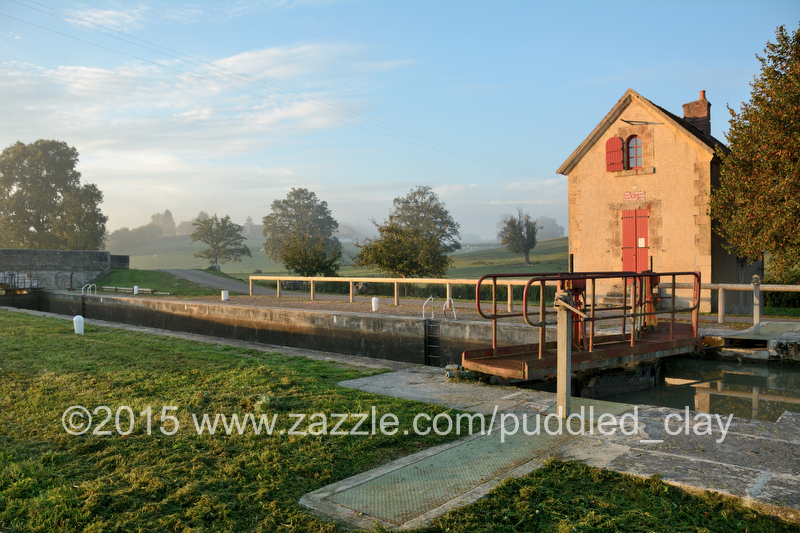 The whole southern part of this canal is very rural but this part seems particularly isolated - lovely!